Manila, Philippines—It is time we heard the voices of our migrant Filipino workers. 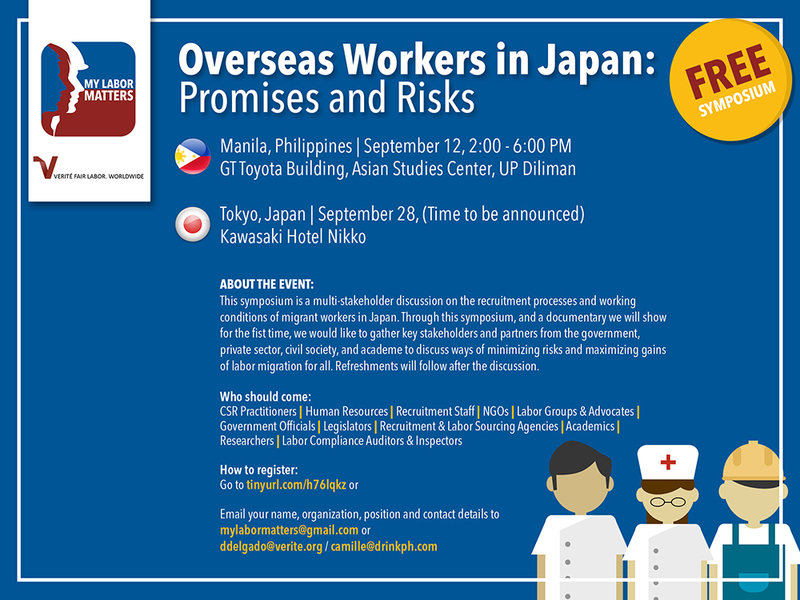 Verité brings you “Overseas Workers in Japan: Promises and Risks,” a free symposium on the recruitment processes and working conditions of migrant Filipino workers in Japan. The event will be held on September 12, 2:00PM to 6:00PM, at the GT Toyota Building, Asian Studies Center in UP Diliman. The same symposium will be held for workers and practitioners in Japan at the Kawasaki Hotel Nikko in Tokyo on September 28. The symposium will begin with a viewing of the short documentary titled ”Ijū-sha: Reportage on Filipino Workers in Japan,” written and directed by Harris Guevarra, that features overseas Filipino workers (OFWs) and their stories of the hardships and opportunities they encountered abroad. Vice President Leni Robredo, known for her involvement in grassroots projects and community service, will attend the event and share her views on migration. Guests are encouraged to participate in a discussion of our OFWs’ respective situations and think of the ways they can help the OFWs through the Philippines’ and Japan’s labor laws. Experts from Verité and representatives from the government and NGOs will lead the discussion and lay down frameworks for improved systems. Refreshments will be served after the discussions and guests will have a chance to build networks and further discuss the topic. 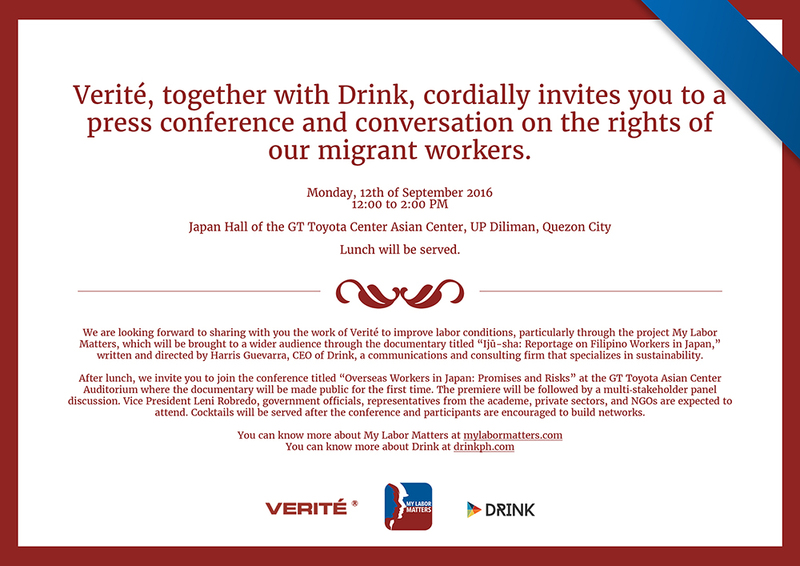 To register, go to tinyurl.com/h76lqkz or email your name, organization, position, and contact details to mylabormatters@gmail.com or ddelgado@verite.org/camille@drinkph.com. The event is expected to be a milestone in the long battle to secure the rights of our fellow Filipinos working abroad and ensure that they are earning the due benefits they are working for. Key stakeholders and partners from the government, private sector, civil society, and academe are encouraged to attend the event and discuss ways to minimize risks and maximize benefits for our migrant workers.